To Cite: Naderi H R, Sheybani F, Rezaei Pajand S. How Should We Manage Latent Tuberculosis Infection in Patients Receiving Anti-TNF-α Drugs: Literature Review, Iran Red Crescent Med J. 2016 ; 18(12):e27756. doi: 10.5812/ircmj.27756. Context: The introduction of new drugs that specifically antagonize tumor necrosis factor alpha (anti-TNF-α) has provided an effective treatment in a wide variety of autoimmune diseases. Nevertheless, the possibility of the reactivation of latent TB (Tuberculosis) infection (LTBI) among these patients is a considerable challenge. The aim of this paper is to evaluate LTBI diagnostic tools in patients who are candidates for anti-TNF-α therapy emphasizing how to manage these patients. Evidence Acquisition: A systematic web-based search was conducted in MEDLINE, Cochrane Library Database, and UpToDate® resources using the key words “anti-TNF-α” and “latent tuberculosis” up to March 2015. Two reviewers extracted and summarized the data and suggested protocols for the diagnosis and management of LTBI in patients receiving TNF-α inhibitors. Results: There were somewhat different approaches proposed by various researchers regarding the subject. While no recommendation was found to be unique to include all patients in all situations, the data emphasize the importance of ruling out TB infection before deciding to start an anti-TNF-α drug. Conclusions: Special high-risk groups, including patients with LTBI, should be treated before receiving TNF-α inhibitors. The tuberculin skin test (TST) is a somewhat cost-effective test for the diagnosis of LTBI. However, its usefulness with respect to false results should be re-evaluated in this situation. TB is a contagious and airborne disease that mostly affects young people in developing countries with a low socio-economic status. Although its mortality and prevalence rates have been declining over the past decades (41% and 36%, respectively), it remains a major health problem in low- to middle-income countries (1, 2). On the other hand, there are an estimated 2 billion people with LTBI worldwide, which makes the issue more intricate (3). It has been proposed that most diagnosed tuberculosis cases are the result of the reactivation of latent infection (4, 5), which can be prevented by an appropriate course of therapy (4). However, it is important to emphasize that the cost-effectiveness of a preventive strategy, especially in high TB-burden countries, should be re-evaluated (6). The overall lifetime progression of LTBI to an overt disease is about 5 - 10%. However, there are several groups of people who are at higher risk of TB reactivation, including foreign-born persons with untreated or ineffective treatment of TB infection within the last 2 years, immunocompromised patients (particularly patients with AIDS or consumers of anti-TNF-α) and patients with a history of gastrointestinal surgery or poor nutrition status (7-9). A systematic web-based search was conducted in MEDLINE, Cochrane Library Database, and UpToDate® resources using the key words “anti-TNF-α” and “latent tuberculosis” up to March 2015. Over 80 research articles, case reports, and guidelines regarding the subject were reviewed. Two reviewers extracted the similarities and contradictions between the suggestions and recommendations in the published materials for the diagnosis of LTBI in patients who are candidates for anti-TNF-α therapy, emphasizing how to manage these patients. A third collaborator reviewed these extracted data to summarize and organize them. To summarize a considerable amount of data with respect to the subject. To highlight the importance of paying attention to the potential role of TNF-α blockers in the reactivation of latent tuberculosis. To discuss in detail the methods for the accurate diagnosis of LTBI. To represent reasonable approaches for the careful management of the patients who are candidates for anti-TNF-α therapy. Some arguments in the article are not verified, and they arise from interpretations of facts. Certain information is not supported by statistical analysis. Some opinions are possibly charged with bias. The article may not have clearly defined outlines. TNF-α inhibitors have been recently introduced as an effective treatment for a wide variety of autoimmune diseases including RA, AS (ankylosing spondylitis), Crohn’s disease, and PsA (psoriatic arthritis). Kwon et al. conducted a study to compare the incidence of active TB among 256 LTBI-positive anti-TNF-α users who received standard LTBI treatment and 521 LTBI-negative TNF inhibitor users and found no statistically significant increased risk of active TB between the two groups. They concluded that it is unclear whether anti-TNF-α therapy increases the risk of active TB infection even after standard LTBI treatment (10). 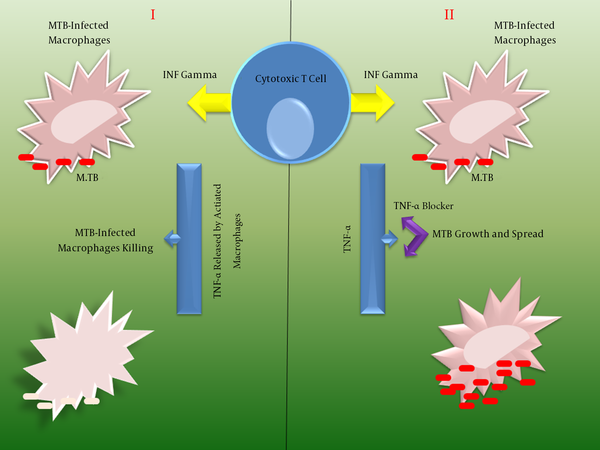 Nonetheless, it has been shown in various studies that anti-TNF-α might facilitate the reactivation of LTBI or the dissemination of newly acquired infection (Figure 1). The mechanism by which TNF-α inhibitors reactivate latent TB has not yet been fully clarified (11). However, TNF-α in combination with TNF-dependent chemokines are presumed as effective host defenses against TB (12) by developing and maintaining the granuloma that surround tubercle bacilli during infection (13, 14). Kindler and Sappino have shown that during BCG (Bacillus Calmette Guerin) infections, TNF is produced transiently and focally by granuloma in response to bacterial challenge and that it contributes to the containment and elimination of mycobacteria. These observations suggest that the localized release of TNF may play a pivotal role in defense mechanisms against certain microorganisms (15). Therefore, a blockade of TNF-α could be responsible for the 4 - 5 fold higher incidence of tuberculosis in patients with latent TB who consume anti-TNF-α drugs such as IFX (infliximab) (16-18). However, the clinical background of the patients and the type of the biological agents may increase the risk of developing active TB up to 25-fold (19). According to a report from Denmark, approximately 6,000 patients have received anti-TNF-α therapy in this country over the past 10 years. With 15 reported cases of TB, this rate corresponds to an incidence of 25 per 105 per year. Comparing this figure with the incidence of 6.7 per 105 per year for TB cases in Denmark’s general population, treatment with anti-TNF-α entails a nearly 4-fold greater risk of developing TB. A study from Sweden in 2008 reported an almost 4-fold increase in risk, with 13 cases of TB in patients treated with anti-TNF-α. Because not all cases are reported, one suspects that the incidence is actually higher (20). Figure 1. I, Interferon-γ and TNF-α released from cytotoxic T cells activates macrophages, triggers apoptosis, and kills Mycobacterium tuberculosis (MTB)-infected cells; II, Anti TNF-α blockers leads to the rescue of surviving bacilli and the dissemination of infection. There are important differences among the TNF-α inhibitors in the risk of TB reactivation. The risk of TB reactivation is higher with the monoclonal antibodies IFX and ADA than with ETN (Etanercept) (136 - 144 per 105 versus 39 per 105 in a study from the UK ) (21). Cantini et al. (22) reviewed the risk of developing active TB in patients with rheumatic disorders receiving non-anti-TNF targeted biologics ANK (Anakinra), TCZ (Tocilizumab), RTX (Rituximab), ABA (Abatacept), and recently approved anti-TNF GOL (Golimumab) and CTP (Certolizumab Pegol). They found no cases of active TB in patients with RA (rheumatoid arthritis) and other rheumatic conditions treated with anti-CD20 + RTX and anti-CD28 ABA. No patient receiving anti-IL-1 (interleukin 1) ANK developed active TB, and an increased risk was excluded in a Canadian database. In contrast, 8 active TB cases were observed in 21 trials of patients with RA receiving anti-IL-6 TCZ. Among GOL-treated and CTP-treated patients, 8 and 10 active TB cases occurred, respectively, while no data are available from registries. However, all but 1 TB case recorded in patients treated with TCZ, GOL, and CTP occurred in TB-endemic countries. With regard to the low risk of TB among those receiving ANK, RTX, and ABA, it can be proposed that pretreatment screening tests for LTBI detection are unnecessary prior to starting these drugs. Because all TB cases occurred in TB-endemic countries, where TB exposure could have occurred during treatment, no definitive conclusions can be drawn for TCZ, GOL, and CTP (22). If active TB occurs shortly after starting an anti-TNF-α, it could represent the reactivation of LTBI, while the late presentation of the disease may be due to either delayed reactivation or recently acquired infection. Reactivation-type TB that is the result of the immunosuppressive effect of chemotherapy drugs or biologic agents could be preventable with the timely diagnosis and treatment of latent infection. Nevertheless, patients who reside in endemic areas or have close contact with people with pulmonary tuberculosis are also at risk of acquiring new infection, which may present after the cessation of latent TB treatment (21). All patients receiving anti-TNF-α with evidence of LTBI should receive preventive treatment, even if complete protection is not ascertain (23). Notably, the adherence of patients to LTBI treatment is crucial. If their compliance is not guaranteed, the prophylaxis may not be effective in approximately one third of cases (11). Evidently, a full course of treatment should be initiated in patients with diagnosed overt tuberculosis. Until recently, TST was the only way to diagnose latent TB infection. This test is sensitive, but not specific enough in the prediction of tuberculosis reactivation in patients with LTBI (24). On the other hand, the cross reactivity of TST with BCG and other NTMs (non-tuberculosis mycobacteria) makes it harder to interpret the results due to the diminishing specificity of the test (25). Nevertheless, TST is still considered an easy and inexpensive screening test with no laboratory equipment needed for clear definitions, making it available worldwide (26). While 10 and 15 mm induration is the minimum accepted size to consider TST positive in medium- and low-risk patients, respectively, (27, 28) immunosuppressed patients, including those treated with anti-TNF-α, are categorized as high-risk patients, for whom at least 5 mm induration in TST is presumed as a positive result. Even using the above criteria, several studies have shown false negative TST results in immunosuppressed patients, which indicates the low sensitivity of TST (27-30). To address this problem, IGRAs (interferon gamma release assays) such as QFT-G (quantiferon-TB gold) and T-SPOT.TB have recently been developed. These in vitro assays measure interferon gamma, which is released by T cells sensitized to specific antigens of M. tuberculosis. Their better sensitivity in immunocompromised subjects (30-32) and higher specificity than TST, due to a lack of cross reactivity with BCG or NTM, makes these two tests more important (32, 33). The SAFEBIO expert panel prefers to use IGRAs instead of TST in cases with a history of BCG vaccination due to the possibility of false positive results of TST in these patients. Due to the discrepancies between TST and IGRA results and the recent data on the superior performance of combined TST and IGRAs in the detection of LTBI in those who are not BCG-vaccinated, the panel recommends the combined use of TST and IGRA as the initial tests in all patients before starting biologic agents (22). Accordingly, the guidelines by the UK’s national institute for health and clinical excellence do not accept a TST alone to detect LTBI in immunosuppressed patients. Hence, TST and IGRAs should be performed at the same time or one after the other if the first test results negative. In cases in which the first one demonstrates a positive result, the other test can be withheld (34). In a study by Kim et al., (35) TST (Tuberculin skin test) and QFT-GIT (quantiferon-TB gold in tube) assay were performed before starting anti-TNF-α treatment for 426 patients with rheumatologic disorders. The positive TST and QFT - GIT rates were 22.3% (95/426) and 16.0% (68/426), respectively, yielding a total of 27.0% (115/426) of positive LTBI results. LTBI treatment was initiated in 25.1% (107/426) of patients, all of whom completed the treatment course. During a median 294-day follow-up period, active TB occurred in 1.4% (6/426) of the patients with negative TST and QFT-GIT results at baseline. Therefore, the authors concluded that either test strategy, using both TST and QFT-GIT assays, is acceptable for LTBI screening before commencing anti-TNF-α therapy (35). Although there are still some rare cases that could not be detected even by the combination of these tests, the false-negative rate is significantly lower than TST alone (32, 36). Most authors, if not all, reported IGRA as a more cost-effective strategy in screening LTBI than TST (37, 38). However, according to another report, it is not recommended that TST be replaced by QFT-GIT in all settings, due to their acceptable correspondence. Above mentioned study also stated that “QFT-GIT offers little advantage over the TST” (39). Kurt et al. evaluated patients with rheumatologic disorders who were candidates for anti-TNF-α therapy for the presence of active infection or LTBI by a chest X-ray and a TST. LTBI was identified in 58 patients, all of whom received chemoprophylaxis for 9 months. None of the patients developed any signs of tuberculosis reactivation during the follow-up period. They concluded that TST is a trustworthy and cost-effective test for detecting LTBI in patients prior to starting anti-TNF-α therapy (40). In a similar study by Hanta et al. 192 patients with rheumatologic disorders who received TNF inhibitors underwent chest radiography and TST before initiating anti-TNF-α therapy. A possible history of close contact with suspicious TB cases was also obtained. INH (isoniazid) prophylaxis was started for all 129 (67.2%) patients with LTBI. They found no case of active tuberculosis during the follow-up period. They suggested that TST is a reliable and available diagnostic method to detect latent TB infection before initiating biologic agents, regardless of the present autoimmune disorder and recent treatment with immunosuppressive drugs (41). In another prospective study by Bartalesi et al., TST and QFT-GIT were performed in 398 subjects with rheumatologic disorders, of whom 310 (78%) were on immunosuppressive drugs and only 16 (4%) cases had a past history of BCG vaccination. Indeterminate results of QFT-GIT were observed in 5 (1.2%) patients; 19% of 393 patients had TST positive results and 13% were positive for QFT-GIT. TST and QFT-GIT results had an acceptable concordance (87.7%): QFT-GIT results were positive in 13 TST-negative cases and 35 patients had QFT-GIT-negative results while they were TST-positive (42). It is noteworthy that either test might re-stimulate the remote hypersensitivity that has deteriorated. Thus, a second test several days after the negative one may have positive results. For this boosting effect, some authors have suggested that either test should be done in 2 steps several days apart. However, the results of some recent studies make the value of such approach uncertain. Munoz et al. screened 726 patients prior to starting therapy with anti-TNF-α via one of three diagnostic approaches performed in three consecutive intervals: a 2-step TST, a 2-step TST plus QFT-GIT, and finally, a single-step TST plus QFT-GIT. They found a lower detection rate of LTBI cases with the single-step TST plus QFT-GIT (26.5%) than with the 2-step TST (42.5%; P < .001) and 2-step TST plus QFT-GIT (38.5%; P = .02). However, the difference between the incidence rates of TB among exposed patients was not significant through the three periods (2.63, 3.91, and 2.4 per 1000 patients, respectively). The authors concluded that neither the 2-step TST nor systematic retesting after negative baseline testing is justified (43). With either strategy, the injection of purified protein derivatives during TST may be responsible for the false positive results of IGRAs if they were performed a few days after TST. Therefore, if TST is performed before IGRAs, it is important to perform the latter no later than two or three days after TST (44). According to Kilic et al., (45) the increased levels of TNF-α during rheumatologic diseases diminish the TST response, while anti-TNF-α therapy recovers this response. A study by Cagatay et al. (46) demonstrated significantly higher TST positivity one year after the initiation of TNF-α inhibitors compared with the onset of treatment. In a study by Chen et al., (47) 27 RA patients who were already treated by ADA(Adalimumab) for at least 1 year underwent TST and QFT-G. During the 2-year follow-up period, they found only one patient with a negative TST/positive QFT-G result who developed active tuberculosis infection. In another study conducted by Bonfiglioli et al., 202 RA patients were screened for LTBI before receiving anti-TNF-α therapy, of whom 44 were TST-positive. During the follow-up period, TST conversion was observed in 5 out of 51 cases who underwent repeated TST. No case of active tuberculosis was found in the 24-month follow-up period (48). In a similar study by Hatzara et al., (49) 70 patients with rheumatic disease who were treated with different anti-TNFs (27 with ADA, 14 ETN, 16 IFX, 8 GOL, 5 CTP) were followed for 1 year. Twenty patients (29%) displayed the conversion of at least one screening assay 12 months after anti-TNF-α therapy: the conversion of TST occurred in 9 (13%), T-SPOT.TB in 7 (10%), and QFT-GIT in 5 (7%). Only 1 patient had concomitant conversion of more than 1 screening test. Univariate and multivariate analyses revealed that only IFX was associated with a decreased rate of TB screening assay conversion. Accordingly, approximately one third of patients with negative baseline TB screening develop the conversion of at least 1 screening test during anti-TNF-α therapy. These findings should be considered when designing re-screening strategies and contemplating latent TB therapy (49). Thus, it seems essential to evaluate patients on anti-TNF-α treatment concerning latent or active TB by extensive history taking, TST (with or without IGRAs), and chest X-rays to treat them effectively in the case of tuberculosis infection. Nevertheless, it should be noted that extra-pulmonary and disseminated forms of TB occur more frequently as a result of immunosuppression achieved by TNF-α inhibitors. Patients with disseminated TB may lack pulmonary symptoms, leading to a delay in diagnosis (21). Regarding the mentioned limited diagnostic power of TST, IGRAs, and culture techniques, the role of molecular methods in TB diagnosis have gained much attention in recent research studies. Multiplex real-time PCR (polymerase chain reaction) could reliably distinguish typical from atypical mycobacterial infections (50). Gholoobi et al. compared smear microscopy with three PCR-based methods using two different DNA extraction protocols. They found PCR was a sensitive, specific, simple and non-invasive method for the detection of MTB in clinical samples (51). Heydari et al. even reported 100% specificity (but low sensitivity) of urine TB-PCR in patients when an adequate sputum sample is not available, or cases with smear negative pulmonary TB (52). It is worth mentioning that whenever all methods for detecting TB infection had negative results, any evidence of active TB in chest radiographs should lead physicians to treat the disease. According to Ebrahimzadeh et al., paying attention to some pulmonary changes that are seen more frequently with statistically significant differences between TB cases and the others by clinicians would improve their diagnosis of the disease (53). It is recommended that if LTBI is diagnosed, TB prophylaxis should be started (54). Some guidelines (55) recommend postponing treatment with anti-TNF-α until the completion of anti-tuberculosis therapy. However, most authorities do not accept such recommendation and suggest it should be safe to start the biologic agents at least 1 month after the initiation of anti-TB drugs (21, 54). LTBI should be treated with a 9-month course of INH (300 mg per day) or a 4-month course of RMP (rifampin) (600 mg per day) or for 3 months with a combination of 300 mg of INH and 600 mg of RMP per day (55). Valls and Ena compared a 6-month INH regimen with the short course INH-RMP treatment concerning patient adherence. They found that an INH-RMP regimen provided efficacy, good tolerability, and a good completion rate in patients with rheumatic conditions who receive anti-TNF-α therapy (56). Finally, the possibility of active TB despite treatment for LTBI in patients treated with anti-TNF-α is still a matter of concern. Yoshikawa et al. reported three cases of active TB in patients receiving anti-TNF-α agents despite treatment for LTBI (58). Whether the occurrence of active TB in this situation is a newly acquired infection or a reactivation of latent infection is unclear. Alavi estimated that the annual risk of pulmonary TB following a recent infection is 300 times greater than the risk of illness from the reactivation of latent infection (59). Similarly, a study of 525 Korean IBD (inflammatory bowel disease) patients (365 anti-TNF-α naïve and 160 anti-TNF-α exposed) reported a significantly higher incidence of TB in patients receiving anti-TNF-α compared with TNF-α-blocker-naïve cases. LTBI was diagnosed in 17 (10.6%) patients, but none of them experienced the reactivation of TB during treatment with TNF-α blockers. They stated that recently acquired pulmonary TB was more prevalent than the reactivation of LTBI (60). The treatment of LTBI may not protect against TB in patients with newly acquired infection. Whether such protection is achieved during the period of prophylaxis is a matter of debate. Therefore, patients who receive anti-TNF-α should avoid contact with suspicious TB cases such as occupational exposures in healthcare facilities, homeless shelters, or prisons in high TB prevalence areas. It is also noteworthy that reactivation-type TB due to INH-resistant strains will not be protected during the treatment period of LTBI with INH (21). Regarding the more than average risk of active TB in patients who receive biological agents, preventive treatment of patients with LTBI should be initiated in high-risk groups for TB reactivation, including patients who are candidates for anti-TNF-α therapy after excluding active TB. While TST is a worldwide available measure to diagnose latent TB, its sensitivity and specificity are low. Whether IGRAs such as QFT-G should be accompanied by TST or even replace it in all cases is a matter of debate, and further studies are needed to recommend such a policy in low or middle-income countries. Authors’ Contribution: All authors contributed equally to the acquisition and interpretation of the data and drafting of this paper. They all read and approved the final manuscript.